Our second generation Query Builder let’s you pull custom metrics from Google Analytics, MixPanel, Localytics, Adobe Analytics, Facebook Ads and more. The Query Builder is our advanced setup engine that allows you to extract custom metrics, events, goals and data with just a few clicks. 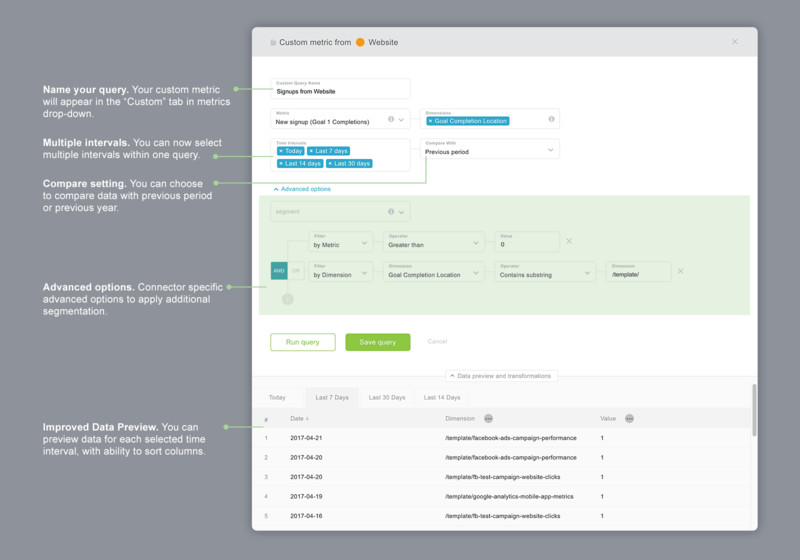 A few years ago, we created Query Builder so we could build custom integrations for Enterprise clients. Soon after making it available to the public, we realized it was helpful for companies of all sizes. And it became increasingly apparent that some users had complex data demands that could not be handled using predefined metrics. Last year, our users made almost 5,000 custom queries. Supporting multiple time intervals with only one query. Making queries accessible right from the Designer, where customers setup visualizations. Improvements behind the scenes, so users don’t have to set correct data types or metric mappings to get accurate numbers. Making the Query Builder a robust service that can eventually be an extension to any of our native connectors. We strongly believe we checked all these boxes and even more. Name your queries. Each query will produce a custom metric that you can name, so it’ll be easier to find it in your query list and within the Designer. In the Designer, all of your queries can be found under the “Custom” tab in the metrics drop down. Multiple time intervals with a single query. Now you don’t need to create multiple queries to cover multiple time intervals. Just select all the time intervals you need and they will be available for that metric. Compare setting. If you want to see the value compared to the previous period or the same period last year, you can now specify that in the Query Builder. On a Number block, it will appear as a change value beneath the actual value. On a line or bar chart, it will add a second line/bar with values from the compared period. Advanced options. This part of the Query Builder form is individual to each connector. It allows advanced segmentations, filters and settings to get the data you need. Improved data preview. Once you run the query, you will see the raw data response from the connector below. If you have selected multiple intervals, the results will be split and you can switch between them with tabs. The data preview shows raw data. You can sort by each column and apply a few transformations to the dimensions (we call them ‘Attributes’). Read about some more technical details in our help docs article. Select the “Visualization Types” datablock menu on the left and drag & drop an empty visualization (ie. Number, Line chart, Table). 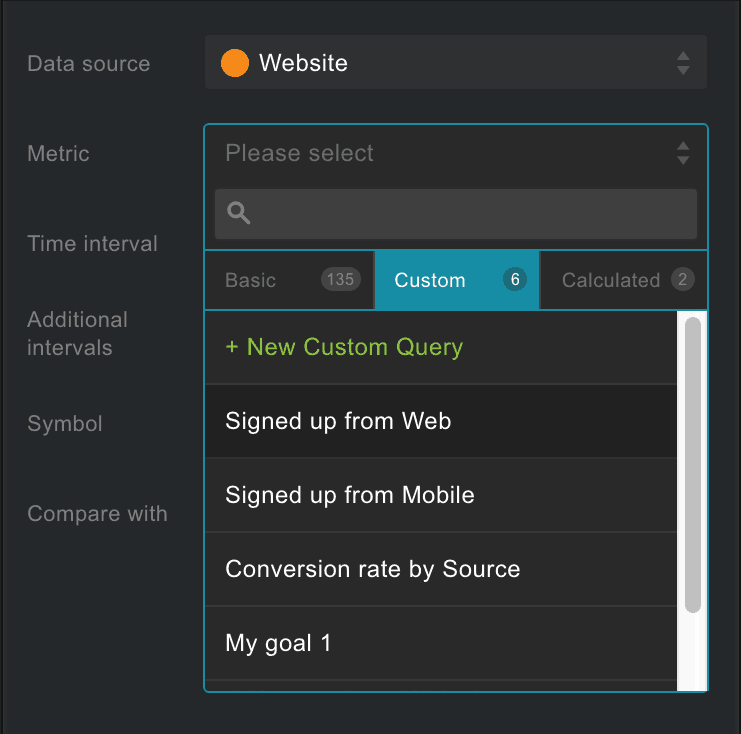 In the Metrics dropdown, switch to ‘Custom‘ and select ‘+ New Custom Query.’ The Query Builder form will pop up. Once you make a custom query, run it to see the results. If you’re satisfied with the settings, save the Query. Once saved, it will start to fetch data. Wait a moment and you should see the data on the Datablock. You can switch between the time intervals that you selected within the query. With the Query Builder, you can now pull the data you need to build advanced reports. We are always eager for feedback, suggestions and ideas on how to improve it further, so feel free to contact us at help@databox.com.